The promise of renewal, white linen dresses and seersucker suits comes with Easter in New Orleans. New Orleans is still mostly a Catholic town and church services begin at sunrise Easter morning. When they finish, the celebrations begin. The day grows festive. People show off colorful fashions. Then, of course, come the parades. Easter Sunday’s lineup of parades starts early that morning with The Historic French Quarter Easter Parade from Antoine’s Restaurant at 9:45 a.m. to St. Louis Cathedral for 11 a.m. Mass. The parade, consisting largely of mule-drawn carriages and old convertibles, makes its leisurely, roundabout way through the French Quarter, handing out stuffed Easter bunnies to the kids, along with other trinkets. 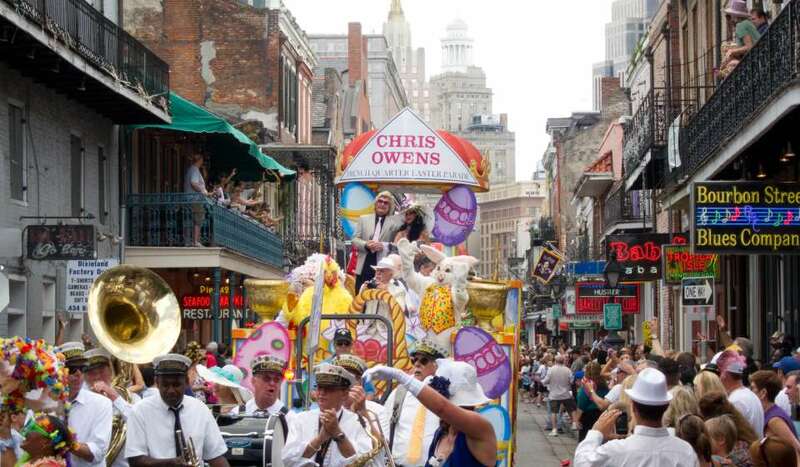 Later, around 1 p.m. is the Chris Owens French Quarter Easter Parade. This tradition, which began back in the early 1980s, features renowned French Quarter singer, dancer and all-around entertainer Chris Owens as the Grand Duchess. She stands proudly on her gaily decorated float, assisted by elegantly attired attendants while decked out in one of her stunning, tight-fitting outfits. The parade starts at the corner of Canal and Bourbon streets and makes its way through the French Quarter, past the Chris Owens Club at 500 Bourbon, with colorful floats and vintage convertibles and accompanied by one or more of the city’s famous brass bands. There are also dance groups and other entertainers. And, of course, since this is a New Orleans parade, there will be plenty of throws – Easter-themed – to catch from the floats and the open-top cars. Then, later in the afternoon, is yet another parade, the Gay Easter Parade, put on by the city’s LGBT community. 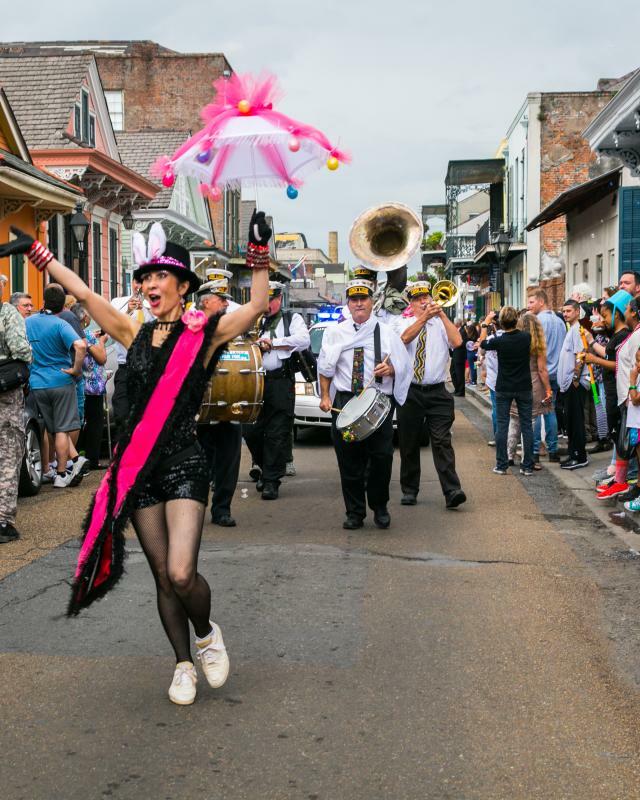 Being nowhere near as wild or extravagant as a Mardi Gras parade, but rather family-friendly, the Gay Easter Parade takes a leisurely route through the French Quarter, passing every gay bar and many gay-owned restaurants and retail shops. The paraders ride horse-drawn carriages or floats while wearing showy versions of their Easter Sunday finest. Don’t be surprised if you see a gaggle of motorcycle dudes in leather and Easter bonnets roar by. Spectators can expect to catch plenty of beads and other throws. The place to be is the amusement park in City Park, where the Carousel Gardens and Storyland are located. Gates open at 9 a.m. and the egg hunt is on at 10. Thousands of colored eggs are hidden around the area, and every kid is almost guaranteed to find at least one: 12 is the maximum. The most-highly-sought-after eggs are the golden ones with special prizes hidden inside. No need to bring your own basket or bag; you’ll place your 12 collected eggs into a provided egg carton. The event is recommended for 8 years and younger and there is a ‘little kid’ area just for toddlers. The kids can also visit with the Easter Bunny and enjoy other types of entertainment. For up-to-date information on this event, head here. Another, smaller but equally fun Easter egg hunt is held on the afternoon of Palm Sunday, a week before Easter, at the New Orleans Opera Association’s Women’s Guild Home, 2504 Prytania St. (corner of 2nd Street). 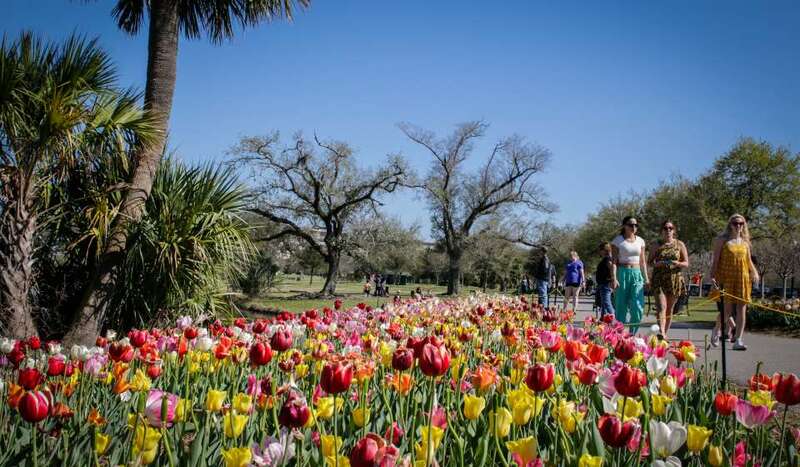 During this children’s Easter party, sponsored by the Women’s Guild Junior Committee, kids hunt for eggs in the picturesque gardens of this elegant Garden District mansion, just one block from the St. Charles Avenue Streetcar line. Finger foods, desserts, drinks and champagne (for the adults) are included in the price of admission. For more information call (504) 529-2278 ext. 227. Yet another Easter fun event for the kids (and their parents) is the annual “Hoppin&apos; Down the River” with Bourgeois the Bunny. The action happens on board the paddlewheel steamboat Creole Queen on the Mississippi River, as it is transformed into an Easter wonderland. There are always fun things for the kids, like balloon sculpting, face painting, storytelling, and games. “Bourgeois, The Cajun Easter Bunny” is on hand to take pictures with the whole family, and there is a buffet of child-friendly food and Easter candy. For more information and reservations, head here or call (504)529-4567. Easter brunches are another old New Orleans tradition; a pleasant ending for the food sacrifices that may have been made during the Lenten season. 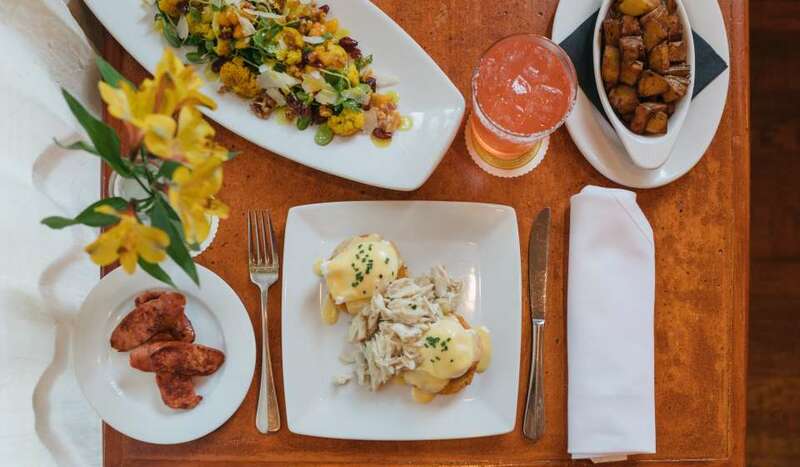 Many of New Orleans’ finest restaurants offer Easter brunches, some even at discounted prices.